This is a “Real Photo” postcard that would have been custom made for the Adams family who owned the house. 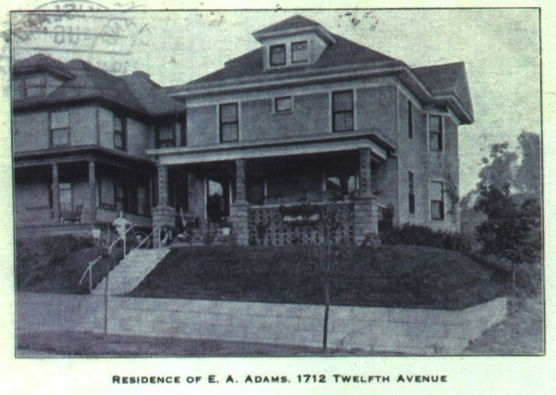 Although caption indicates it is at 1712 12th Avenue, today its address is 1712 13th Avenue. Around 1915, 11th Avenue in this Rock Island area was eliminated causing a few other avenues and many addresses to be renumbered. Elsworth A. Adams, the original owner, was a pressman for the Modern Woodmen of America. His family lived here until the mid 1940s. During their ownership, the home was converted to a duplex in the early 1940s, requiring an additional front doorway. Mrs. Adams penned a note on the back of our postcard, which she mailed in 1912, to a friend in Pennsylvania. She wrote, “Arrived home safely and found Bud’s yard looking beautiful with a mass of different colorings among the flower beds…..” Although we don’t see many flowers in front, shrubs and trees have been planted to the side. Notice the flower box on the porch railing and the girl standing nearby holding her bicycle. The Adams house was built about 1910, during a time of great popularity for what is called the American Foursquare style. Because it was especially widespread in the midwestern states, it has also been called the Prairie Cube. A uniquely American style, it was mostly built between 1904 through the 1930s. It provided the maximum amount of living space within a simple exterior that was economical to construct. In contrast, the irregular foundations and convoluted walls previously popularized on Queen Anne houses were costly. Foursquare interiors could be simple or as elegantly appointed as any Queen Anne. The basic American Foursquare is easy to identify. It is a two-story (plus attic) house with a square footprint and a hipped roof. Usually the four corners of the first floor hold a hall, living room, dining room and kitchen. The second story contains three or four bedrooms and a bathroom. The hall, containing the stairway was usually located along the side wall with the less pleasing view or the least sun exposure. In our example, the stairway is located along the left or east side wall. A Foursquare roof has at least one dormer above wide eaves. Exteriors were decorated in various ways to provide an overall impression of other styles. Colonial Revival Foursquares usually had plain clapboard siding, round porch columns, and perhaps dentil trim. Tudor Foursquares were stucco with applied timber, frequently in porch gables, and sometimes diamond leaded windows. A Craftsman Foursquare would usually be stucco with some stone trim. With its rock textured concrete porch columns and stucco siding, we can call the Adams house a Craftsman version of the foursquare. Originally the porch railing and the screening below the porch were also rock-like concrete laid in an openwork design. The foundation, too, is concrete and heavily textured. Stucco was used for Rock Island residences beginning about 1907 and quickly became the exterior finish of choice for many for the next two decades. The Adams house adds a few other embellishments to the basic foursquare. Notably visible on the postcard is a large bay with a separate gabled roof near the rear. But the Adams house also has a large back portion of the house that does not show on the postcard. This means the home is really larger than the classic foursquare, but because of its appearance from the street, it is still reflects the style. Also not visible on the postcard, but probably original, is the two-car garage within the basement, that is entered from the alley at the right. Even the stone retaining wall on the steep lot appears to be original. Try to identify Foursquares as you travel through town. When you see groups of several Foursquares, you will know a single builder probably built them at the same time. And if they are in original (no new siding) condition, observe them carefully to see how the builder made each one slightly distinct from the others – rather like the cartoons where you search for the differences in seemingly identical drawings. This article by Diane Oestreich is slightly modified from the original, which appeared in the Rock Island Argus and Moline Dispatch on August 11, 2002.